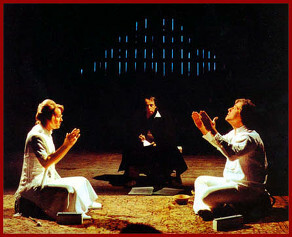 Karlheinz Stockhausen's In The Sky I Am Walking is a work for two solo voices which he wrote in 1972. The texts include poems, sayings, or prayers of various American Indian tribes, in English translations from an anthology called Indian Prose and Poetry. The work is in fact the only independent portion of far larger work, Alphabet fur Liege. In The Sky I Am Walking is being revived this Autumn by two young singers, tenor George Chambers and soprano Rebecca Hardwick. They have been invited to the Stockhausen Foundation in Kürten, Germany where they are workshopping the piece with the original singers Helga Hamm Albrecht and Karl O. Barkey. There is a chance to hear the work as Chambers and Hardwick have put together a rather enterprising tour. Included in the programme with the Stockhausen is a new work by Daniel Lewis Fardon, Dark Eyes, which has been written specially for the tour, and also they will perform Ode Machines from Cornelius Cardew's The Great Learning which they performed earlier this year with the Scratch Orchestra at the Union Chapel. Full details from the In The Sky I Am Walking website - alas the two singers are not planning to walk between the engagements!